Coventry lies at the very heart of England and is easily accessible by road, rail and air. Coventry - Travel by coach - If you'd like to speak to someone about your journey you can ring Traveline on 0871 200 22 33. www.centro.org.uk. www.travelcoventry.co.uk. www.petestravel.co.uk. www.stagecoachbus.com. (Photo right: Bus in the centre of Coventry). Coventry - Travel by road - Coventry is about 3 miles SW of Junction 2 of the M6 Motorway. The M6 Motorway travels north - south and connects to the M1 at Rugby then on to Carlisle. The M6 Toll is north of Walsall and Sutton Coldfield and bypasses the M6 the areas around Birmingham and Wolverhampton. Coventry is about 215 miles from Carlisle and 10 miles from Rugby. Coventry - Travel by road - The A 45 and the M 45 Motorway takes traffic from Coventry to the M1. Coventry - Travel by road - Coventry is about 3 miles SW of the intersection of the M 69 and M 6 Motorways. The M 69 Motorway links Leicester and Coventry. Coventry is about 26 miles from Leicester. Coventry - Travel by train - Coventry Station, Station Square, Eaton Road, Coventry, West Midlands, CV1 2GT. CCTV. Ticket office. Waiting room. Refreshment facilities. Pay phone. Shops. Toilets. Wheelchair accessible toilets. Whole station step free access. Wheelchairs available. Taxi rank. Coventry station is directly connected to Warwickshire via Bedworth, Nuneaton, Rugby and Leamington Spa. Coventry is on the Main West Coast Line. Coventry Airport Customer Services, Phoenix House, Coventry Airport South, Siskin Parkway West, Coventry CV3 4PB. The passenger terminal is located just off the A45 at Toll Bar End Roundabout. Coventry Railway Station is 3 miles from Coventry Airport. Coventry airport is about 3 miles from Coventry city centre. coventryairport.co.uk. Birmingham International Airport Ltd, Birmingham, B26 3QJ. Tel: +44 (0)8707 335511. The airport has an extensive range of facilities to offer passengers, visitors and staff whilst at the airport. The airport rail station is only a two minute ride away, and just one mile from Junction 6 of the M42. The airport is adjacent to the National Exhibition Centre. Birmingham airport is about 10 miles from Coventry. Coventry - Sport - City of Coventry (Brandon Wood) Golf Club, Brandon Lane, Coventry, Warwickshire, CV8 3GQ. Tel: 02476543133. Coventry Golf Club, Finham Park, Coventry, West Midlands, CV3 6RJ. Tel: 02476414152. Coventry Hearsall Golf Club, Beechwood Avenue, Coventry, West Midlands, CV5 6DF. Tel: 02476713470. Coventry - Sport - Coventry City FC, Ricoh Arena, Phoenix Way, Foleshill, Coventry, CV6 6GE. Tel: 0870 4211987. ICE SKATING. PLANET ICE COVENTRY, Sky Dome Arena, Croft Road, Coventry CV1 3AZ. Tel: 02476 630693. Ten Pin Bowling. Coventry Tenpin, Crosspoint Business Park, Olivier Way, Coventry, CV2 2SH. Tel: 0871 550 1010. Coventry - Sport - Coventry Sports and Leisure Centre, Fairfax Street, Coventry CV1 5RY. Tel: 024 7625 2525. Foleshill Sports and Leisure Centre, Livingstone Road, Foleshill, Coventry, CV6 5AR. Tel: 024 7625 2525. Foxford Leisure Centre, Grange Road, Longford, Coventry, CV6 6BB. Tel: 024 7664 4786. Ernesford Grange Leisure Centre, Princethorpe Way, Coventry, CV3 2QD. Tel: 024 7645 3121. Coventry, West Midlands, CV1 1DE. Tel: 024 7663 1616. Coventry Arena Park - Unit 4-5 Arena Retail Park, Classic Drive, Rowleys Green, Coventry, CV6 6AS. Tel: 02476 666826. British Home Store Coventry - 43-47 The Precinct, West Midlands, CV1 1DD, Tel: 0845 8410167. Coventry - Shopping - West Orchards Shopping Centre is part of the famous Coventry City Centre Precinct. West Orchards Coventry, Smithford Way, Coventry, CV1 1QX. Tel: 024 7623 1133. Cathedral Lanes Shopping Centre (Photo right), Broadgate. Tel. 024 76632532. Coventry - Entertainment and attractions - The Herbert, Jordan Well, Coventry, West Midlands. Tel: 024 7683 2386. A multi-million pound redevelopment scheme including a new cafe, 3 new galleries and educational facilities. The Belgrade Theatre, Belgrade Square, Coventry, CV1 1GS. Old Spon Street contains a number of Tudor aged buildings, some of which have been rebuilt there after being saved from demolition in other streets. Coventry - Other information - Coventry Transport Museum, Millennium Place, Hales Street, Coventry, CV1 1PN. Tel: 024 7623 4270. Midland Air Museum, Coventry Airport, Rowley Rd, Baginton, Coventry, West Midlands, CV8 3AZ. Tel: 024 7630 1033. Lunt Roman Fort Museum, Coventry Rd, Baginton, Coventry, West Midlands, CV8 3AJ. Tel: 024 7630 3567. Coventry Central Library, Smithford Way, Coventry, West Midlands. Tel: 024 7683 4905. Coventry University, Priory Street, Coventry, CV1 5FB. Tel: +44 (0)24 7688 7688. Coventry has long been a provider of education. The University occupies a large campus right in the centre of Coventry City . Includes: Sports Centre, Modelling Laboratory, Library, Aerospace laboratory (features a full-size Harrier Jump Jet and Scout helicopter). For hotels accommodation in other areas nearby see Redditch hotels & Birmingham hotels. For bed and breakfast accommodation see bed and breakfast in Leamington Spa & bed and breakfast in Kenilworth. For self catering see self catering accommodation in Warwick & self catering accommodation in Leamington Spa. Birmingham is 118 miles from London. It is 18 miles from Halesowen to Sutton Coldfield and 30 miles from Solihull to Wolverhampton. 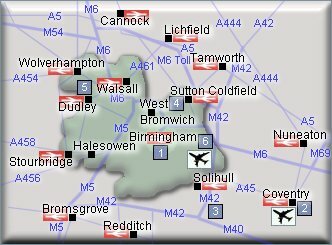 Airports indicated are Birmingham International and Coventry. Coventry is about 3 miles SW of Junction 2 of the M6 Motorway. Rail Stations (Not all stations shown). There is a station in Coventry. - Birmingham Museum and Art Gallery, Chamberlain Square, Birmingham, B3 3DH. Tel: 0121 303 2834. bmag.org.uk. - Coventry Toy Museum, Whitefriars Gate, Much Park Street, Coventry, West Midlands, CV1 2LT. Tel: +44 (0)2476 231 331. - Packwood House, Lapworth, Solihull, Warwickshire B94 6AT. Tel: 01564 783294. - Sutton Park Visitor Centre, Sutton Park, Park Road, Sutton Coldfield, B74 2YT. Tel: 0121 355 6370. - Dudley Concert Hall, St James's Road, Dudley, West Midlands, DY1 1HP. Tel: 01384 815577. - The NEC, Birmingham, England, B40 1NT. Tel: 0121 780 4141. necgroup.co.uk. Statue of Lady Godiva in Coventry.